In most of our lives, technology provides convenience, entertainment, and a moment of distraction. For some, however, tablets can become a needed connection to the outside world. The power of technology to connect people is a centerpiece of CTN’s program with SAHA, now in its third year. The program, funded by CPUC, is designed to train seniors on how to use tablets to stay active and build confidence with technology. 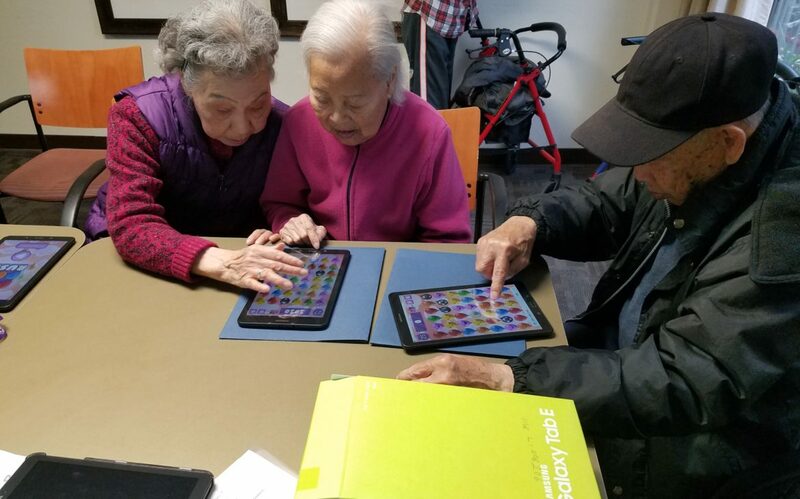 One of the eight tablet classes at SAHA is taught entirely in Cantonese, as many residents are unable to participate in an English-only version of the class. In January alone, two classes were taught in Cantonese, two in Mandarin, and four in English. Next month, CTN will alternate and offer Vietnamese, Korean, Russian, and Farsi classes as well. The students of the Cantonese class are among the oldest in the SAHA program, all from 80 to 90 years old. With this advanced age comes additional challenges to approaching technology, including physical and mental disabilities. To aid them in their journey, the class has two graduates of the program and two caregivers on hand. Despite all of these challenges, the students are learning a great deal about the exciting things tablets can bring to their lives. They have learned much about using the internet and email safely with their devices. This includes information and advice on spotting scams and dangerous online material. Beyond safety, the class is focusing mainly on hands-on activities that are easy to engage with and learn without getting too tired. So far, students have worked on listening to music with various apps, watching videos on YouTube, and playing touchscreen games. Since none of the students have cellphones or computers, a lot of the material is brand-new. Can you remember the first time you used the internet?